Planning to explore the beautiful sites of Jaipur? Then Heritage Cabs is available at your service since 2002. The above tour duration is for 8 hours, which you can extend. Have a look at our Jaipur Sightseeing tours below, along with tour of nearby of Ajmer, Pushkar, Agra, Ranthambore, Jodhpur etc. Hire our AC Cab for 1 day sightseeing tour of Jaipur, for minimum 8 hours. 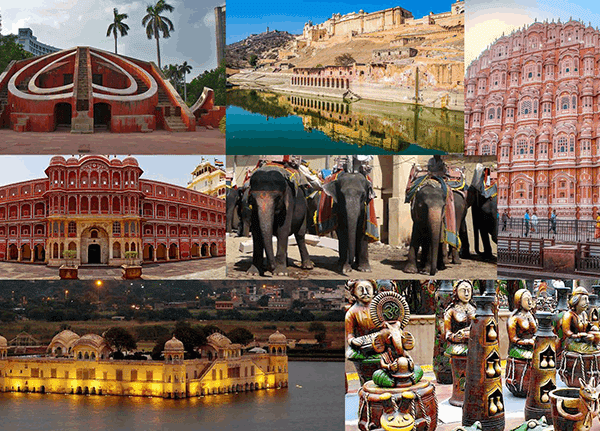 Here you will visit all tourist sites like Amber Fort, Jal Mahal, Hawa Mahal etc. Rs. 2000 for Toyota Innova (8 hours). You can also book a Rajasthan government approved tour guide for whole day at Rs 500. We offer 2 Night tours of Jaipur which starts at Rs 450 per person (for minimum 2 pax) in sedan car & you can get complete details about them by clicking the below button. In this package we offer city sightseeing in Bus. The duration of this package is 8 hours (9:30 AM – 5:30 PM) & you will visit: Rajmandir cinema, Birla Temple, Ram niwas garden, Central Museum, Jaipur City Palace, Royal Gaitor, Amber Fort, Kanak vrindavan garden, Hawa mahal & Jal mahal. Tour duration is 8 hours per day.You can extend the tour after 8 hours. In this package, we will enjoy a sightseeing tour of Jaipur (8 hours) on day one. On Day two we will drive towards Ajmer & Pushkar to see sites like Ajmer Sharif Dargarh, Brahma temple & Pushkar Lake. The cost of this package is Rs 1600 + 5500 = Rs 7100 in sedan car (4 pax). Day 1 will be for Jaipur tour (8 hour tour), & on day 2 we will visit Agra. 1.Rs 7200 in a sedan cab. 2.Rs 9000 in Toyota Innova. Day 1 will be booked for top tourist sites in Jaipur. Ranthambore National Park. Ranthambore safari booking will be done in advance. Chand Baori is a beautiful stepwell site which is getting global recognition. Chand Baori is 100 km from Jaipur, and we present two days tour where we will first visit must-see tourist sites in Jaipur. On Day 2, we’ll visit Galta Monkey Temple, Sisodia Rani Bagh & Chand Baori. Day 1 will be reserved for Jaipur Sightseeing tour, and on Day 2 we’ll first visit the haunted fort of Bhangarh. Later you will enjoy a tour of UNESCO World Heritage site of Keoladeo National Park, also known as Bharatpur Bird Sanctuary. 1.Hawa Mahal: 9 am – 4:30 pm | Rs 50 & 200. 2.City Palace: 9 am – 5:00 pm | Rs 75 & 300. 3.Birla Temple: 9 am to 12 noon & 3 pm to 9 pm. 4.Amber Fort: 8 am to 5:30 pm | Rs 100 & 500. 5.Jal Mahal: Open 24/7 & no entry fee. 6.Albert Hall: 9 am to 5 pm | Rs 40 & 200. 7.Jantar Mantar: 9 am to 4:30 pm | Rs 50 & 200. 8.Bapu & Johari Bazar: 8 am to 8 pm. 9.Royal Gaitor: 9 am to 4:30 pm, Entry free. 10.Sisodia Rani Bagh: 8 am to 5 pm | Rs 50 & 200. 11.Nahargarh Fort: 10 am to 5:30 pm | Rs 50 & 200. 12.Jaigarh Fort: 9 am to 4:30 pm | Rs 35 & 200. Rs 300 per person, valid for two days. One can visit some amazing sites from Jaipur. The most popular ones are Ajmer Sharif & Pushkar Lake, Taj Mahal, Fatehpur, Khatushyam, Salsar Balaji and Ramgarh Shekhwati. For more details, check out article on Top 20 places to visit near Jaipur. Heritage Cabs don’t suggest hotels to their guests, if not asked. And our article on Top 10 hotels is prepared by calculating the reviews on top hotels and the one which our guests booked when they visit Jaipur. Click the below button to view the complete list of Top 10 hotels in Jaipur. Jaipur is a favourite destinations to celebrate popular festivals such as Holi and Diwali. And along with this, Jaipur has 6 festivals which are connected with it culture. Click the below button to know more about the popular festivals of Jaipur. – 135 km from Jaipur and Pushkar is just next to Ajmer.